On 9th February morning, Afzal Guru, the mastermind behind the 2001 Parliament attack was hanged in secrecy after the rejection of his mercy petition by President of India. Now some of the media and the Human Rights Activists have started glorifying the terrorist Afzal Guru and are spreading views against the hanging of Afzal Guru. They raise three points. (1) Afzal Guru was not given proper legal support to defend himself; (2) the Supreme Court and other judgements were based on the 'circumstantial evidence', as he was not directly involved in the attack on Parliament' and (3) the judgements were based on 'collective conscience' and not as per law. This case has gone through Trial Court, High Court and then finally Supreme Court, before the review by President of India. Such capital punishments are awarded in the rarest of rare cases, with due care and application of mind. Three eminent Senior Advocates Mr Ram Jethmalani, Mr Shanti Bhushan and Mr Sushil Kumar have appeared in the Supreme Court on behalf of the accused. The Supreme Court Judgement may be downloaded from this link. It is sad that the terrorists who challenged the sovereignty of the nation by attacking the Indian Parliament are glorified and defended by Indian Human Rights activists and some of the popular TV and Print media. We can understand the anger of Terrorist groups in Pakistan against the hanging of Afzal Guru. But, a patriotic Indian is not able to digest the arguments of these Human Right activists. They never raised their voice when these terrorists killed hundreds of innocent citizens at Coimbatore, Mumbai, Delhi and other places. They never talk about the 20 Security officials, who died along with Rajiv Gandhi. When the terrorists themselves do not believe in human rights and human values, why should they be given all respects as a human being. The secret hanging of Kasab and Afzal Guru are being criticized by these activists. These terrorists are the enemies of humanity and they do not deserve any sympathy. It may be recalled that US killed Osama Bin Laden and threw his body in the mid sea. 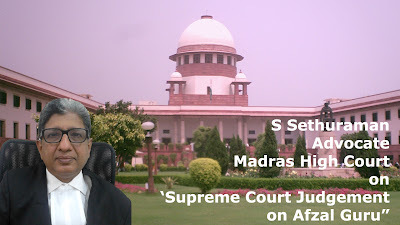 With this background, we conducted a telephonic interview with Mr S Sethuraman, one of the senior most lawyers of Madras High Court on the various issues raised by these activists about Supreme Court Judgement. 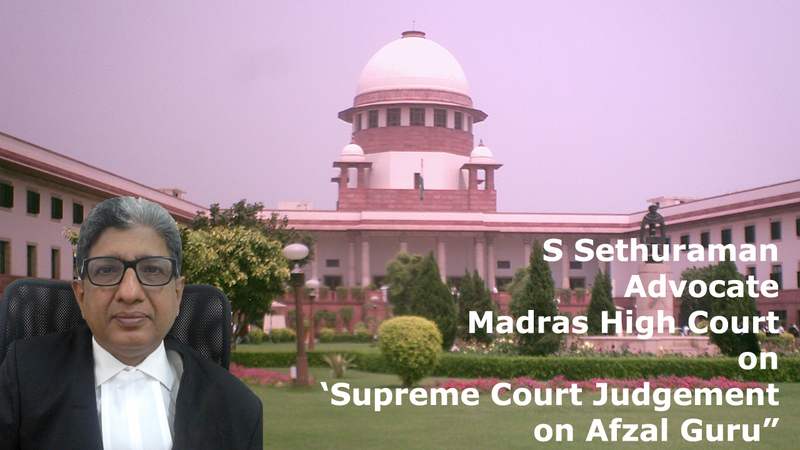 In this interview, Mr Sethuraman explains clearly how the Supreme Court has gone into the various aspects of law and finally awarded the death penalty on Afzal Guru. He explains that Afzal Guru was the mastermind and the conspirator of this attack. According to the principle law of justice, conspiracy cannot be proved beyond doubt and it can be established only through various circumstantial evidences and links, since 'conspiracy' is hatched in 'darkness' without any eye witness or evidence. He says that the Supreme Court has analysed this case in depth and examined all the aspects, before confirming the death sentence. Further, Human Rights Activists demand the abolition of capital punishment, even for convicts under terrorism. Mr Sethuraman argues that murder committed for gain and the terrorism acts are totally different and they have to be dealt with separately. In the murders for gain, only few people are affected. In the case of terrorism acts, besides large number of deaths, the economy, relationships in the society are strained. These terrorism acts are to be considered as a 'war against the sovereignty of the nation' and has to be dealth with severely under law. Please listen to the interesting and informative interview with Mr S Sethuraman. (12 minutes). This interview is also available in the Youtube link.